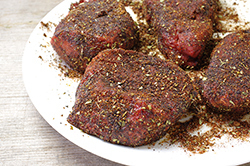 The Creole Coffee Rub gives a New Orleans French Quarter twist to this recipe for grilled filet mignon. 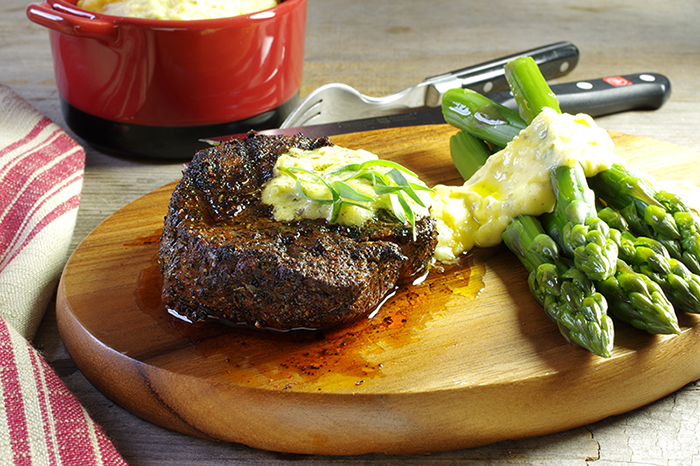 Then we go classic and pair the coffee-rubbed steak with a luscious Béarnaise Sauce for a special dinner. Grill asparagus along with this, bake a Potato Gratin ahead of time, and all you need is an elegant tart or flourless chocolate cake for dessert. 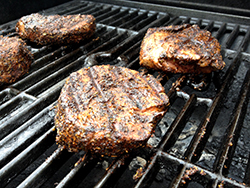 As you let the steaks rest, the internal temperature will go up 10 degrees, so keep that in mind as you grill. 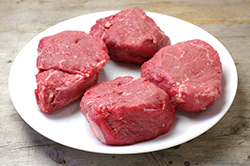 You can always put an under-done filet mignon back on the grill, but you can’t rescue one that is over-cooked. 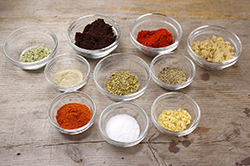 Make the Creole Coffee Rub in a small bowl by combining the coffee, paprika, brown sugar, mustard, salt, cayenne, black and white peppers, tarragon, and oregano. Stir to blend and set aside. Brush the steaks lightly with olive oil and season on both sides with the rub. Grill the steaks, covered, for 3 minutes on each side for medium-rare, 130°F (50°C). Serve each steak with a spoonful or two of the Béarnaise Sauce. This is a bolder version of the classic understated Béarnaise, which makes it perfect for grilled foods, from burgers and steak to artichokes, asparagus, chicken, lamb, fish, and shellfish. Emulsion sauces like this one sometimes get cranky or excentrique and separate – usually if you’ve left them on higher heat too long. If that happens, don’t despair. Remove the sauce from the heat and gently whisk in a small ice cube, and all should be well – and smooth – again. In a small saucepan, bring wine, vinegar, shallot, tarragon, and salt to a boil over high heat. Boil until reduced to about 2 tablespoons, about 8 minutes. 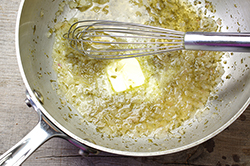 Reduce heat to low and whisk in butter, one piece at a time, until melted. 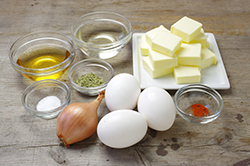 Whisk in egg yolks and cook, whisking constantly, for 4 to 5 minutes, or until slightly thickened. Remove from heat and whisk in pepper to taste. Whisk in more tarragon, if desired. 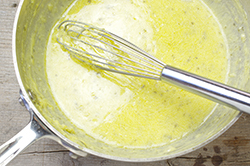 VARIATION: Sauce Paloise: Substitute white wine vinegar for tarragon vinegar and dried mint for the tarragon.